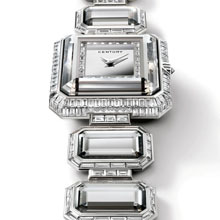 For its autumn-winter 2009/2010 collection, CENTURY has added an even more exclusive timepiece to its GRACE line. CENTURY has drawn inspiration from the rich aesthetic heritage of the Art Deco period for its divine collection, GRACE. With its streamlined shape, clean lines and bold design, GRACE is like a sculpture, revealing a subtle blend of elegance and modernism. A finely crafted piece of jewellery from the impressive and exclusive MASTER IMPERIAL collection. GRACE is the power of a shape and a cut that have come to embody CENTURY’s distinctive style. Its case, crafted in CENTURY sapphire, gleams with more than 30 facets, all hand cut and polished by the watchmaker’s master jewellers. This methodical and harmonious construction bestows an aura of perfection on this unique timepiece. Complementing the straight lines of the case, the bracelet is formed of an impeccably regular chain of links in CENTURY sapphire. Its extremely refined design is further enhanced by the setting of baguette-cut diamonds. The dial subtly balances the mineral colour palette with its mirrored finish. In daylight, the monochrome shades of this timepiece are instantly illuminated in a fascinating combination of shapes and colours. CENTURY works its magic… Diamonds and sapphires dazzle us with an impressive display of reflective light. GRACE, the epitome of harmonious design, evokes the dazzling light of day and reveals its own unique style. 925.7.M.206.55.W73 Model in 18 ct. white gold set with 164 baguette-cut diamonds and one brilliant-cut diamond (4.98 ct.). CENTURY sapphire with 40 facets cut and polished by hand. Mirrored dial. Quartz movement. Bracelet in 18 ct. white gold set with 177 baguette-cut diamonds (8.70 ct.) and formed of 8 CENTURY sapphires with 32 facets cut and polished by hand. Ref. 925.7.M.206.55.W73 Model in 18 ct. white gold set with 164 baguette-cut diamonds and one brilliant-cut diamond (4.98 ct.). CENTURY sapphire with 40 facets cut and polished by hand. Mirrored dial. Quartz movement. Bracelet in 18 ct. white gold set with 177 baguette-cut diamonds (8.70 ct.) and formed of 8 CENTURY sapphires with 32 facets cut and polished by hand.